Will Somali Islamist purge strengthen al-Shabab? The surrender of Somalia's veteran militant Islamist, Sheikh Hassan Dahir Aweys, signals that his faction has lost the battle for control of the al-Shabab group to hardliners determined to step up their military campaign to establish an Islamic state in the East African country. The 78-year-old - whose trademark is a goatish beard, coloured with red henna - was forced to give himself up to government forces last weekend, fuelling speculation that his life was under threat from the young Islamists who once revered him as their elder statesman, but have now rallied behind his bitter rival, Afghan-trained Ahmed Abdi Godane. Somali analyst Hassan Abukar, writing in the African Arguments blog of the UK-based Royal African Society, said Mr Aweys' surrender came after Mr Godane's fighters had staged a "coup" in al-Shabab, killing the group's co-founder Ibrahim al-Afghani, who also fought in Afghanistan and was a close ally of late al-Qaeda leader Osama bin Laden. Al-Shabab's former spokesman Mukhtar Robow has also been forced to flee, reportedly to the southern Bay and Bakol region where his Rahanweyn clan is based. "In a single stroke, Godane, the emir of al-Shabab who goes by the nom de guerre of 'Abu Zubeir', managed to re-align the radical group's leadership dynamics and further consolidated his power by getting rid of his major detractors," Mr Abukar said. For Kenya-based Somali analyst Rashid Abdi, Mr Godane's victory suggests that al-Shabab will intensify its military campaign to establish an Islamic state in Somalia. "It will want to show that it remains a cohesive force, and my fear is that there will be an escalation of conflict, with more bombings. It is still a potent military force," he told the BBC. Al-Shabab has carried out a spate of hit-and-run attacks and bombings, especially in the capital, Mogadishu, after the African Union force launched an offensive in 2011 to help the government recapture territory. In the most recent attack on 19 June, at least 15 people, including four foreigners, were killed in an assault on a heavily guarded UN office in Mogadishu. "The group has been successful in attacking soft targets, such as the UN compound, perhaps to distract its fighters from debilitating fragmentation among its leaders," said Mr Abukar. "It is unlikely that this terror group will vanish from the political scene in Somalia in the near future. Godane and his followers will continue to exploit the government's inability to exert its control outside Mogadishu." Former BBC Somali Service editor Yusuf Garaad Omar says Mr Aweys' surrender is a political coup for the government, and its regional and Western allies. "Al-Shabab is highly secretive, and he is intelligence material for the government. They will expect him to download information about its leadership structure, training and funding sources. In that sense, his surrender is a blow to al-Shabab," he told the BBC. A security officer in the regime of autocratic ruler Siad Barre who was overthrown in 1991, Mr Aweys had a reputation of being a Somali and Islamic nationalist, in contrast to Mr Godane's image as a global jihadist who led al-Shabab into an alliance with al-Qaeda last year. 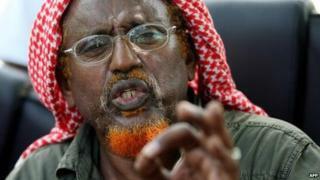 "Aweys is the father of the jihadist ideology in Somalia, and supported suicide bombings. But he was a bit averse to foreign influence, and more perceptive to public opinion because his goal was to achieve power," Mr Abdi told the BBC. However, Mr Garaad argues that Mr Aweys was forced to join al-Shabab about three years ago as it had the upper hand over his Hizbul Islam militia. "Aweys relied more on local resources and was conquered by al-Shabab, which had foreign links in terms of training and know-how," he says. His feud with Mr Godane - who refused to anoint him as "spiritual leader" - boiled over last year when Mr Aweys used a Friday religious sermon to accuse al-Shabab's top brass, as Somali journalist Abdi Aynte wrote at the time, of "monopolising jihad, globalising the Somali conflict, assassinating innocent Somalis and, more damningly, acting in a manner unbecoming of upright jihadists". Mr Aynte said Mr Aweys - who had been designated a terrorist by the US and UN in 2001 - preferred a "primarily nationalist ideology" in Somalia. "For more than three decades, Aweys defined Somalia's narrative of political Islam, earning him both friends and foes within the Islamic movements... He argued that Islam is the only answer for Somalia and can be the only uniting factor against tribalism and factionalism," he said. As for the younger generation led by Mr Godane, they are simply "caught up in the cult of martyrdom" fuelled by al-Qaeda, says Mr Abdi. "They don't care about public opinion. They want to establish an Islamic state through military conquest, and they love martyrdom more than power," he told the BBC. However, it is far from clear that Mr Godane has the backing of al-Qaeda. "Two months ago, Ibrahim al-Afghani wrote an open letter to Ayman al-Zawahiri, the leader of al-Qaeda, in which he criticised Godane for targeting foreign jihadists, imprisoning them in secret detention centres in the areas the terror group controls, and even killing them," Mr Abukar says. The foreign jihadists who joined al-Shabab - including US citizen Omar Hammami known as "al-Amriki", who reportedly survived an assassination attempt by Godane loyalists - have become increasingly disillusioned with it, he says. "Moreover, the influx of foreign jihadists into Somalia has, for all practical purposes, decreased and further eroded the place of that country in the annals of global jihad." For Mr Aynte the in-fighting suggests that al-Shabab is on the path of "self-immolation". "In the final analysis, the split within al-Shabab is yet another chapter in Somalia's extraordinarily complex political system, where alliances shift constantly. The break-up presents another dilemma for the international community, as it attempts to help Somalia resuscitate itself from 20 years of state collapse," he added. The fate of Mr Aweys is unclear. He could be charged with war crimes or he could end up joining a peace process, focusing on winning over youth from al-Shabab. But the more likely scenario is that he will negotiate his retirement, Mr Abdi told the BBC. "He is still seen as a father figure by certain Somalis, and the government may decide to let him fade away. He is old now, and probably thinking of his retirement, but there are many Somalis who won't forgive him for what he did to their country."